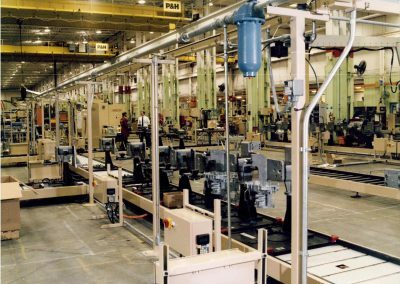 The challenge was to create a heavy duty roller conveyor that did not require the ongoing maintenance and adjustment of friction rollers or clutches normally encountered. 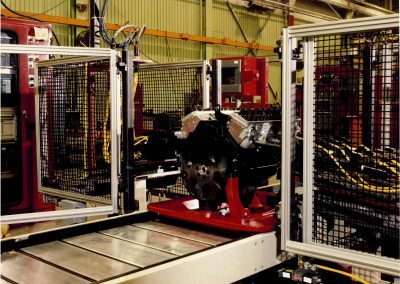 An additional challenge was reduce the ongoing maintenance or pallet stops that take a continuous beating as 700 – 1000 pound pallet slammed into them. 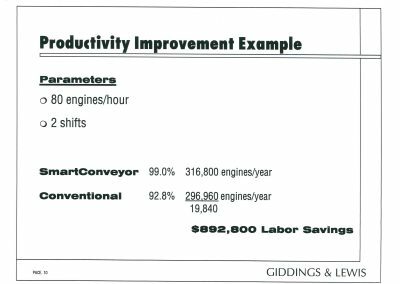 The solution was to eliminate the clutch altogether! 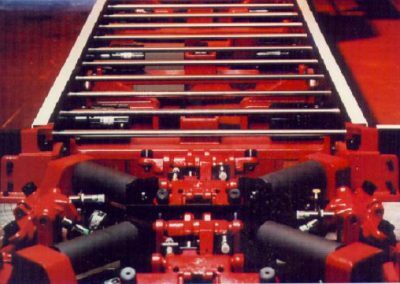 By using a unique electric motor to drive just one or two rollers an “electric clutch” was provided that eliminated all mechanical clutches. 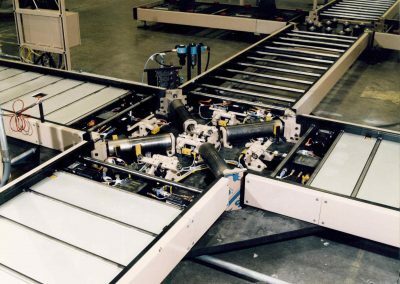 By adding a series of sensors and the required controls the conveyor was able to stop the pallet by reversing the electric motors – eliminating the mechanical stops altogether. 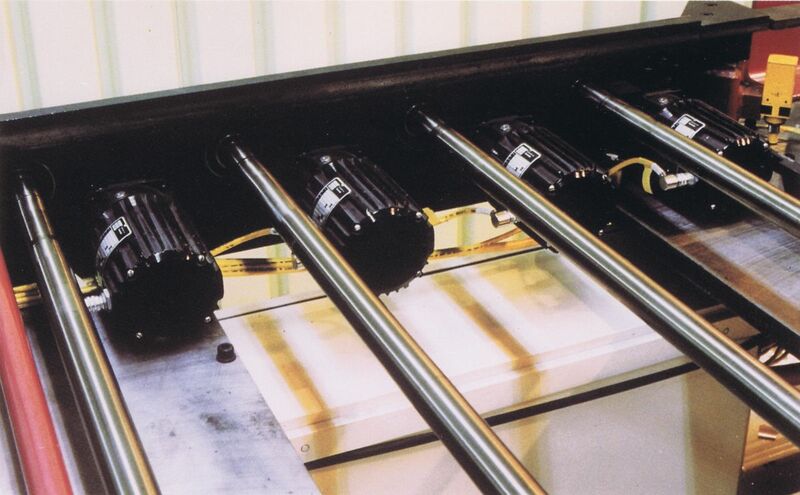 This conveyor was extremely reliable as nearly all wear items were removed. 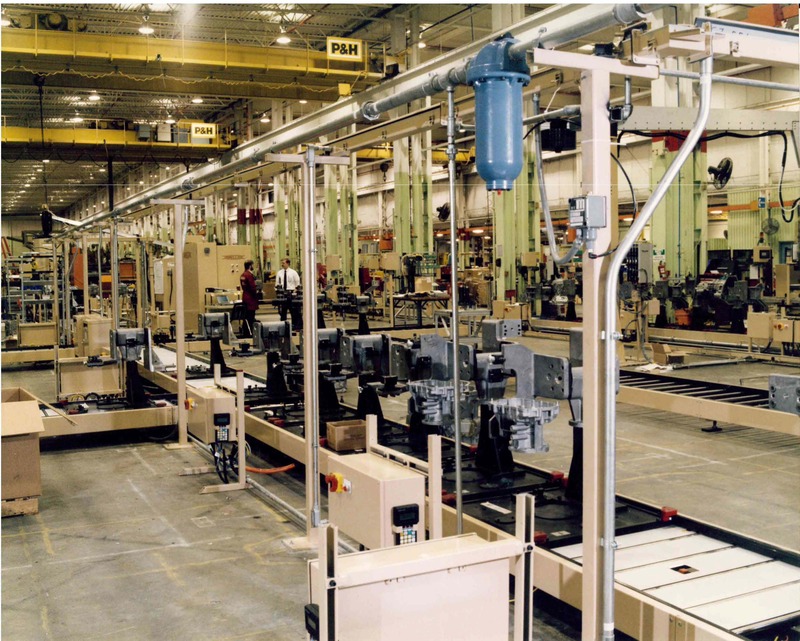 It set a new standard for up-time within the customer’s plants. 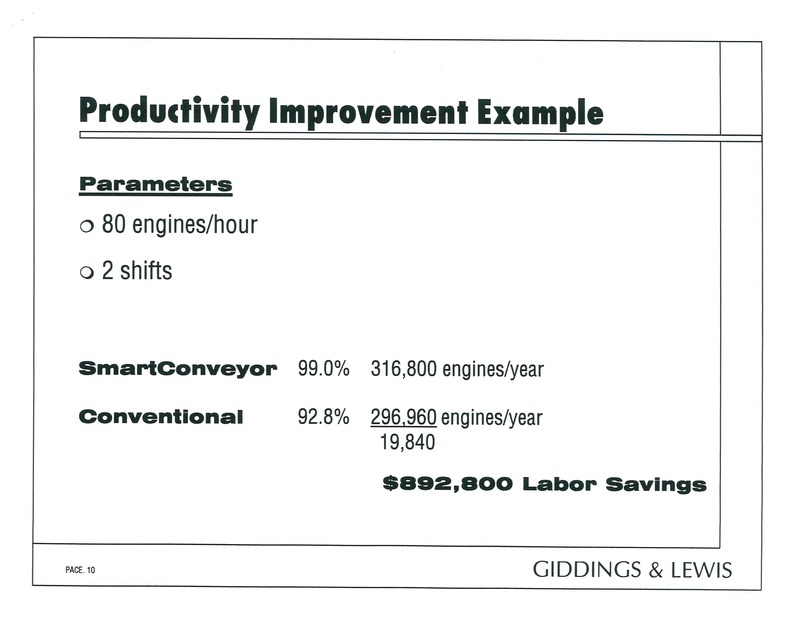 Conveyor maintenance dropped from two full time employees to 15 minutes per month. Click on image to view full patent. Several custom components were developed specifically for this new conveyor. 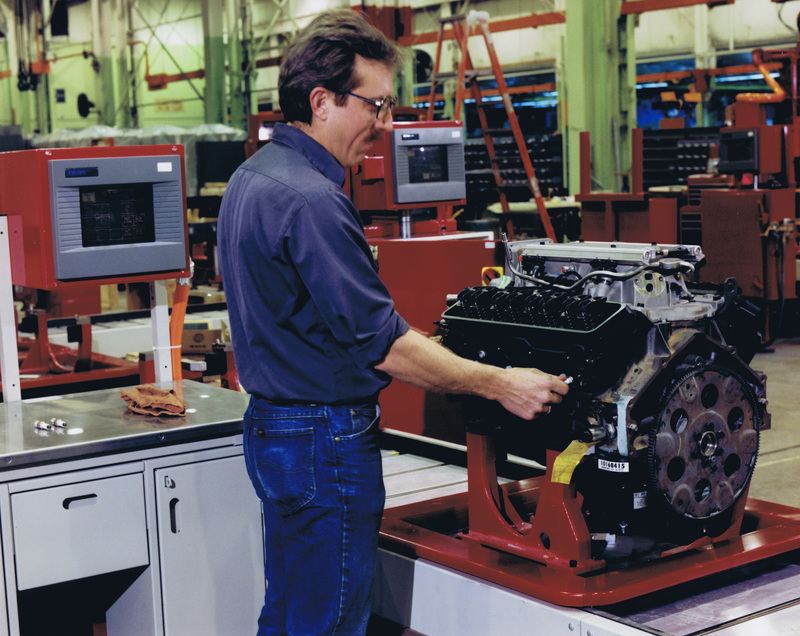 First of all the motors were created by combining a standard gearbox with a special version of a torque motor. It was literally impossible to burn out the motor as it dissipated as much heat as it could generate. 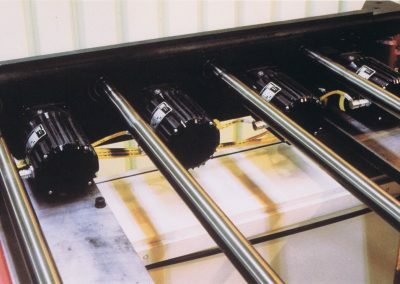 A special I/O module was also developed to operate this conveyor. 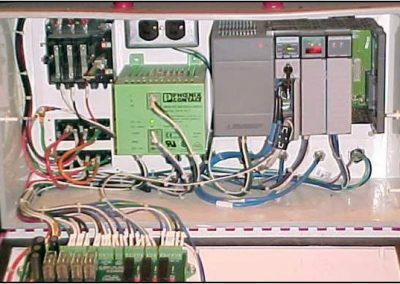 The single block turned on and off two sets of three phase motors , changed the direction of the motor, monitored the motor current, and protected the motors with onboard fuses. It also monitored two inputs, and monitored the sensors for short circuits or open circuits. 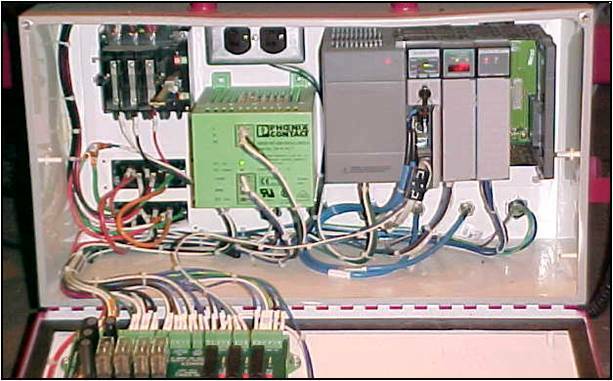 The module was controlled using a DeviceNet network. Both in and out ports were provided for the network, as well as the three phase power supply, so that the cables could be daisy chained from one block to the next. Another special DeviceNet block was created by InterLink based on our requests. 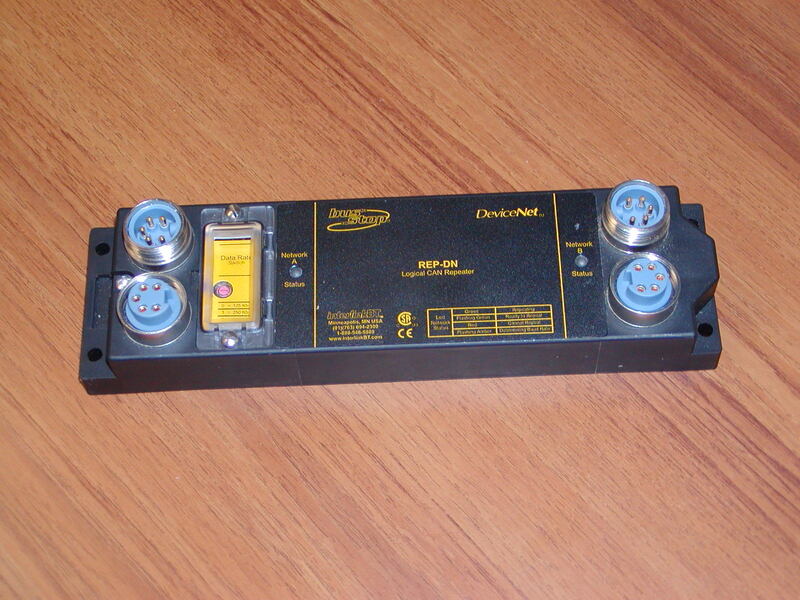 The block provided bidirectional I/O so that one network could communicate with another. 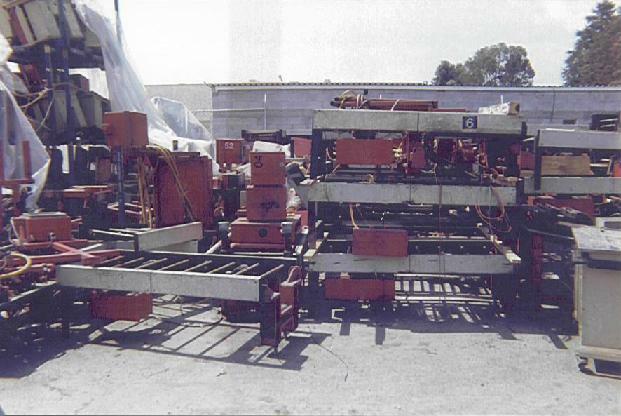 This allowed each conveyor module to communicate with its neighbors so that a pallet was not transferred into a module that was not ready to receive it. 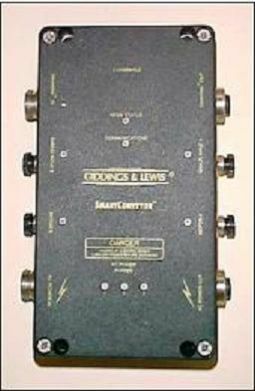 The block shown below is the current version of this product. 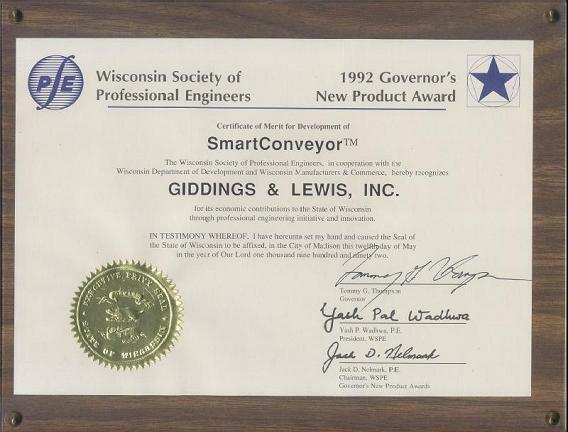 It was given to our founder by Interlink in appreciation for suggesting the idea for the product. 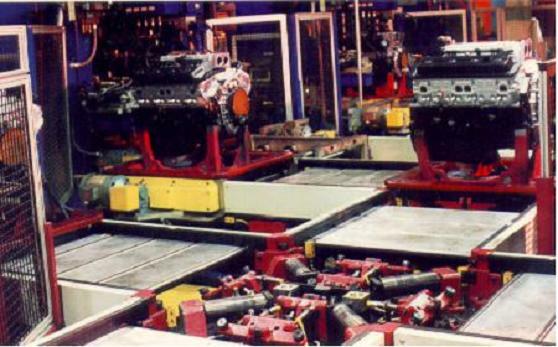 In spite of setting efficiency and uptime records for assembly lines within the corporation, the two assembly lines were dismantled when the plant was closed. 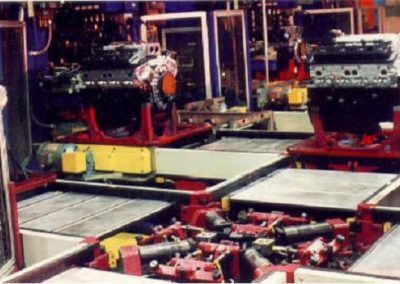 After transporting millions of V8 engines the systems were brutally ripped up and trucked to Mexico where the modules were stacked like firewood, (mostly uncovered) in the parking lot of the plant. The modules were stored like this for many months until the floor space was available for reassembly. 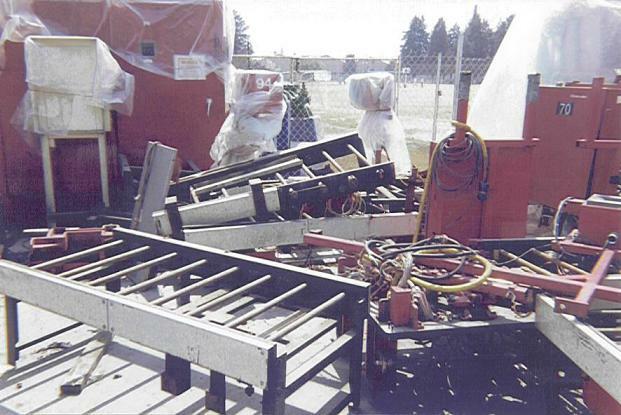 Castings and electric motors were literally broken in half during the transport and stacking. 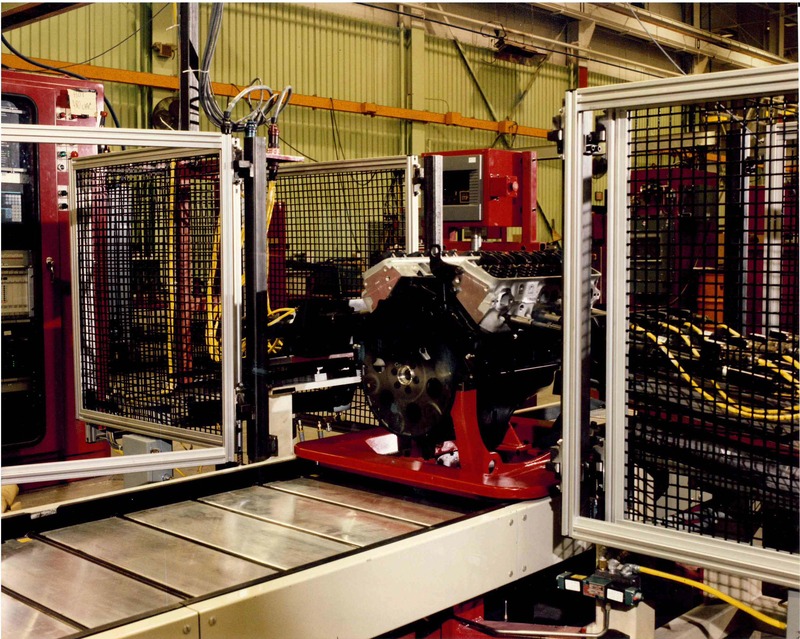 After this “less than ideal” treatment the modules were reassembled to create one “new” assembly line.  Many bearings had to be replaced and rust had to be manually removed from many, many parts but the system was brought back to life and operated for more than ten years after it was first installed. 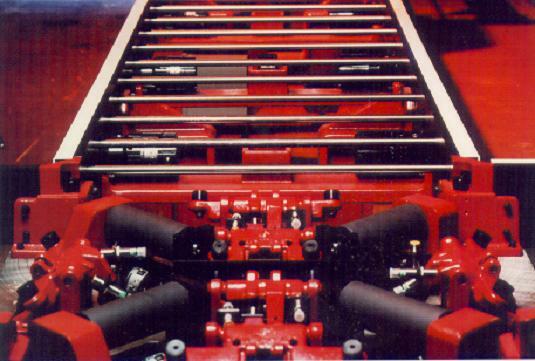 This story is not only a testament to the ruggedness of conveyor itself but also the many components that made it up. Even the PLC’s and operator interface screens survived the ordeal.